Franschhoek, Cape Winelands, South Africa, September, 2010 – The Common Room, the latest addition to the exceptional Le Quartier Français culinary experience, offers diners a menu packed full of lip smacking delights designed by Margot Janse to serve as snacks or the building blocks of a more substantial meal. Margot, in creating this new experience says “Food is constantly evolving and changing and people enjoy food at different times ………we have created a menu that will encourage people to chill out, taste, share and enjoy good times in great company. Being aware that not every meal has to be a “huge spend” we have kept the prices small and the idea is to share with friends.” Fish pops with chakalaka ketchup, bone marrow with salsa verde crust, chocolate and milk ice cream sandwich, are just a few of the WOW-bites on offer. Occupying the space previously used by iCi, Le Quartier Français’s, bistro-style restaurant, The Common Room is poised to become Franschhoek’s favourite foodie hangout; the perfect place to relax and linger with friends over a tasty dish or two, the local grazing ground. Here guests can meet up for drinks and snacks or pop in, sans reservation, for a scrumptious breakfast, lunch or dinner. In a truly delightful twist The Common Room has a strict no reservations policy. This ensures that it is refreshingly first-come first-serve in its attitude towards guests and great cocktails can be enjoyed while waiting for a table. The Common Room combines the best ingredients, in both its menu and décor, to create another mouthwatering dining experience at Le Quartier Français. 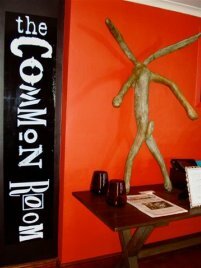 The Common Room is open 7 days a week from 7.30 am to 10.00pm. Le Quarter Français is a luxurious Relais & Chateaux country inn situated in the French Huguenot valley of Franschhoek, in the Cape Winelands. The Auberge offers eleven en-suite bedrooms, three Grande Rooms, two Petite Garden Suites, and two deluxe suites (with splash pools), which open onto a rose-filled central courtyard and swimming pool. And for the ultimate in luxury, there are four state-of-the-art suites, The Four Quarters, overlooking a private pool and sun-splashed deck.The Tasting Room under the expert guidance of Executive Chef Margot Janse has been in the San Pellegrino top 50 restaurant list for 7 years.